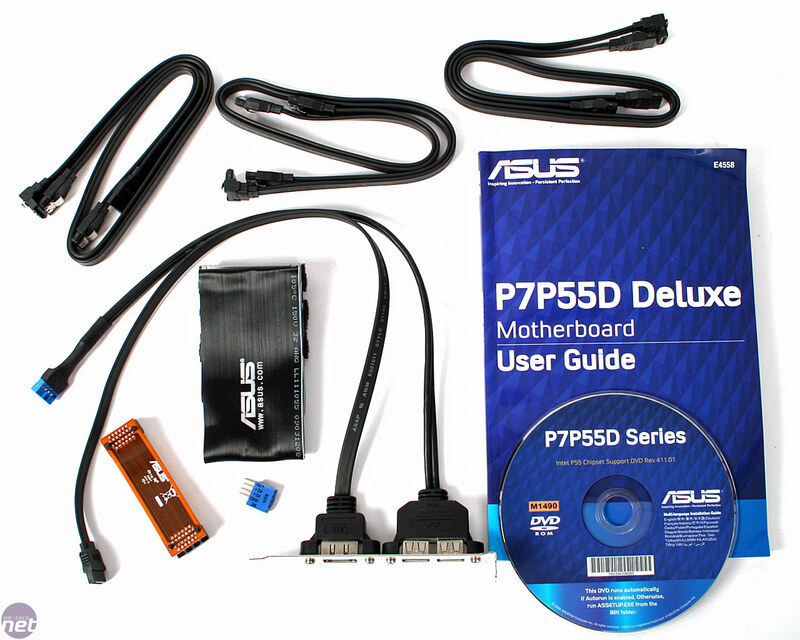 Like the launches that have preceded this, it was almost inevitable that Asus would be the first to get us a retail boxed P55 board, so in respect to this, it's again the first we are reviewing. 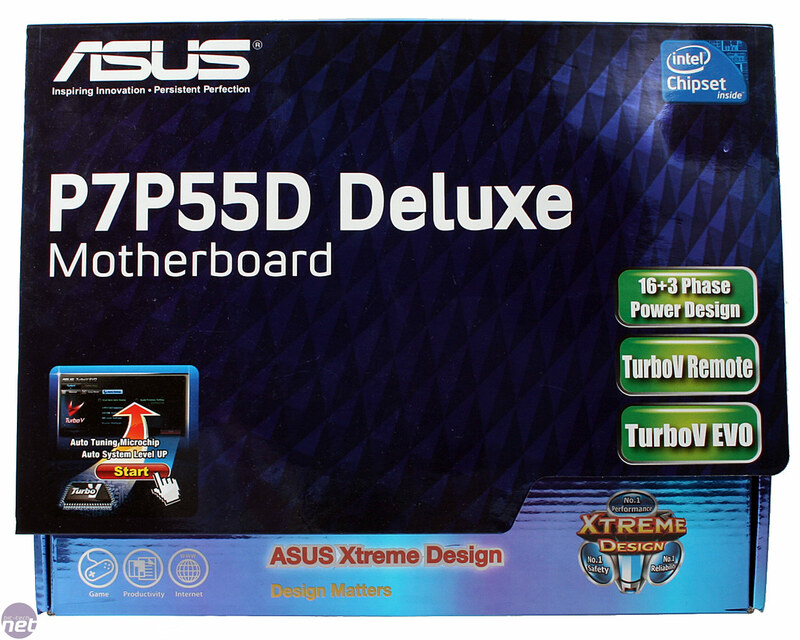 The Deluxe is a standard launch board for Asus, and has done very well for the company in the past with many boards such as the P6T Deluxe, P45 Deluxe, ASUS M2N32-SLI Deluxe WiFi Edition and Asus P5B Deluxe WiFi-AP Edition all receiving our recommended awards. 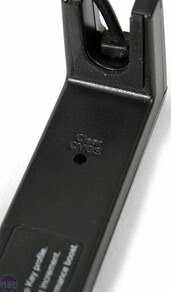 It's not all strawberries and waffles though, with the odd flop product (the M4A79-T Deluxe for example) along the way. 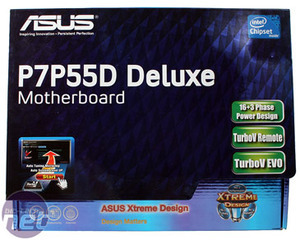 Asus hopes to continue the trend with its P7P55D Deluxe; a board that includes the usual wealth of Asus features, but also commands a higher price. With P55's higher bill of material cost anyway, and the most able competition ever from Gigabyte and MSI, does Asus have enough might in performance and features to still stand out? Let's find out. Inside the box there are a few bits we haven't seen before. For starters, there's the TurboV Remote, which may look like something you use for a stairlift, but actually it's an evolution of overclocking and BIOS profile control outside of a software driven environment. It plugs into the motherboard and gets routed out the rear I/O and onto your physical desktop where the buttons can control the PC, even turning it on, just as there is standby power. 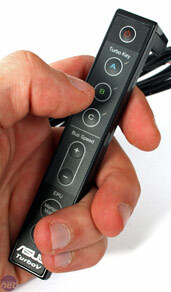 The +/- buttons control the CPU base-clock directly, so it can be overclocked at any time. The disadvantage is that you need to reboot to change the CPU multiplier, but this did help us quicker find the maximum stable base-clock and overclock, rather than having to constantly restart the machine. 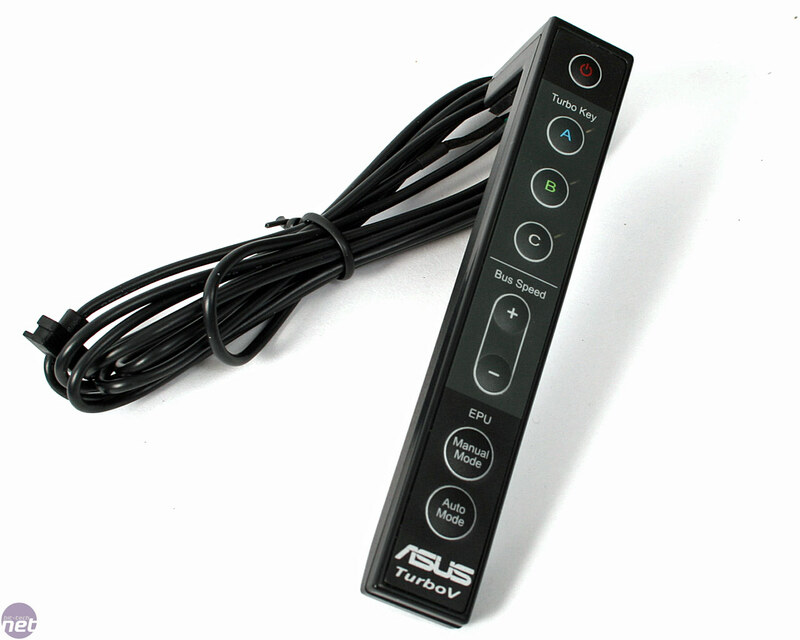 There are buttons for auto or manual control of the Asus EPU, should you use it, and the ABC buttons can be assigned to BIOS profiles. While the Lynnfield CPUs do an excellent job of clocking up and down themselves, if you want more control it can be particularly useful to have two profiles: one highly underclocked and undervolted for light everyday PC use, then another heavily overclocked for gaming or file encoding. All the applications overlap a little which can be confusing, but this just means there's more choice and you can take and leave what you like. The annoying part is that whenever the buttons are pressed a whole screen greys into an unnecessary overlay that takes far too long. While it does make the button press visually obvious, it's also incredibly distracting if you were doing other things. On the back there's even a clear CMOS button - an excellent idea! Now we don't even have to poke around in or around the PC at all: perfect for those who have delicate watercooling or an internal layout you don't want to touch. 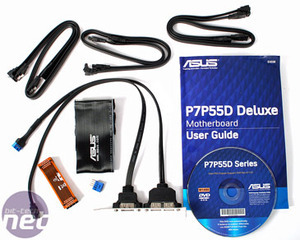 In addition to all this, there are six SATA cables, some with 90 degree connectors, an SLI bridge, IDE cable, manual and driver disc and a PCI bracket with an extra pair of USB and an eSATA port. We like the optional eSATA, because it means you can choose which internal port is used, so RAID arrays from the P55 can be expanded externally, for example.